So…. we didn’t redo the pictures, and here they are. My super dooper ‘homemade’ looking vegan oatmeal chocolate chip cookies. I mean most of my recipes look ‘homemade’ – that’s exactly what they are after all! So there’s no shame in that, but now and again, I feel a bit awkward if it looks like it’s going a bit too far that way! 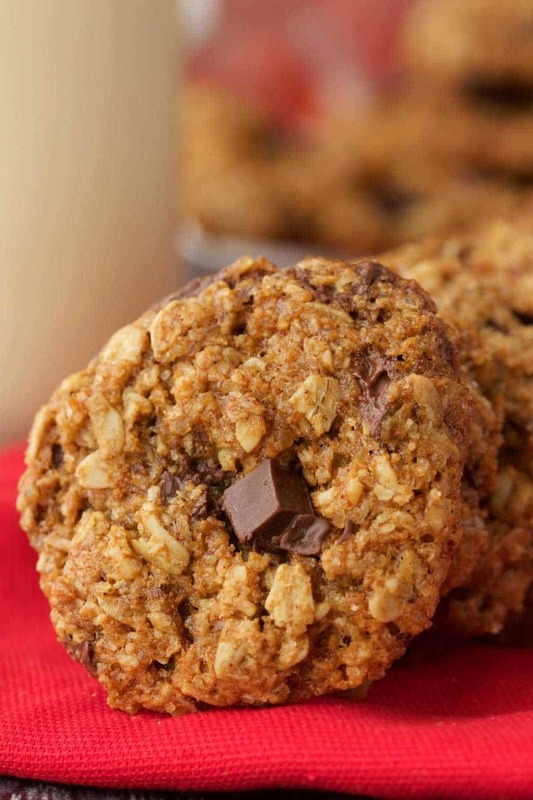 But maybe in the case of oatmeal cookies, this is a good thing. The taste was certainly spectacular! 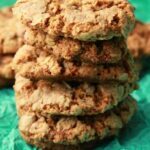 This recipe was very closely based on my simple vegan oatmeal cookies recipe. I just added in chocolate chips (well, chunks for me, since I can’t get chocolate chips here so I just chop up a bar of vegan chocolate into chunks) and made a couple of small adjustments to the recipe to account for the chocolate chips. 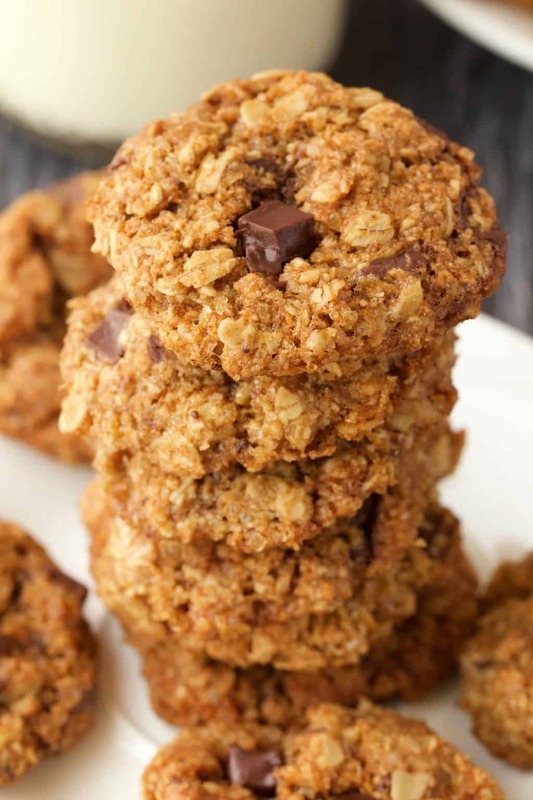 Just as with the original recipe, this is a super easy, really straightforward recipe, with a very wholesome oatmeal, coconut, cinnamon, brown sugar delicious flavor and texture! 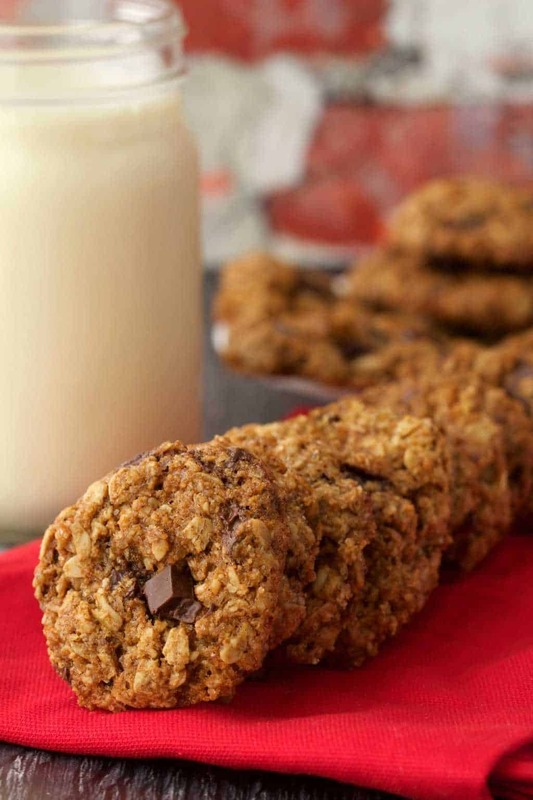 Adding in chocolate chips to get all melty in there makes this recipe just the bees knees! You can keep them covered at room temperature, or covered in the fridge. I did not notice any drying out in the fridge, so long as they were covered. They stay fresh for up to a week. 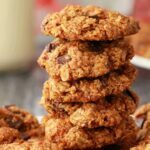 So let us know your thoughts about these vegan oatmeal chocolate chip cookies! Love ’em? Let us know in the comments! And if you make them, tag a pic on instagram #lovingitvegan so we get to see it too! I wanted to just choose 3 or 4 other cookie recipes to highlight above but suddenly there were 7 instead! So hard to choose! 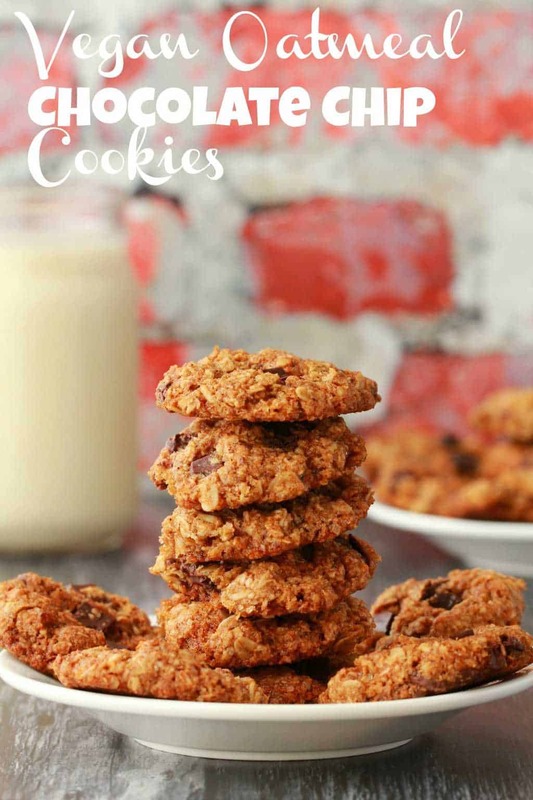 Sign up to our email list and you’ll get a free recipe book (yay!) and you’ll stay updated with all our latest recipes posted to the blog! 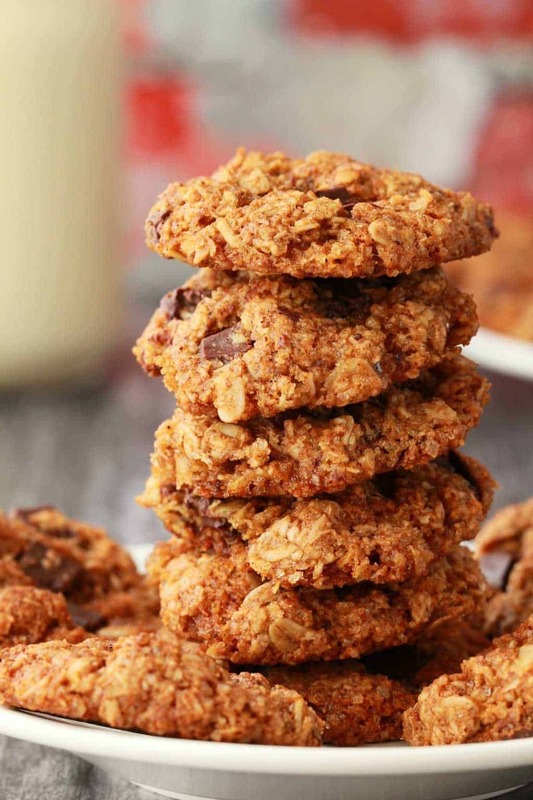 Deliciously chewy vegan oatmeal chocolate chip cookies. 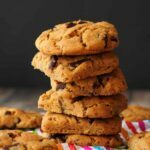 Packed with chocolate chips, these brown sugar sweetened treats are easy and fun and make a perfect dessert. 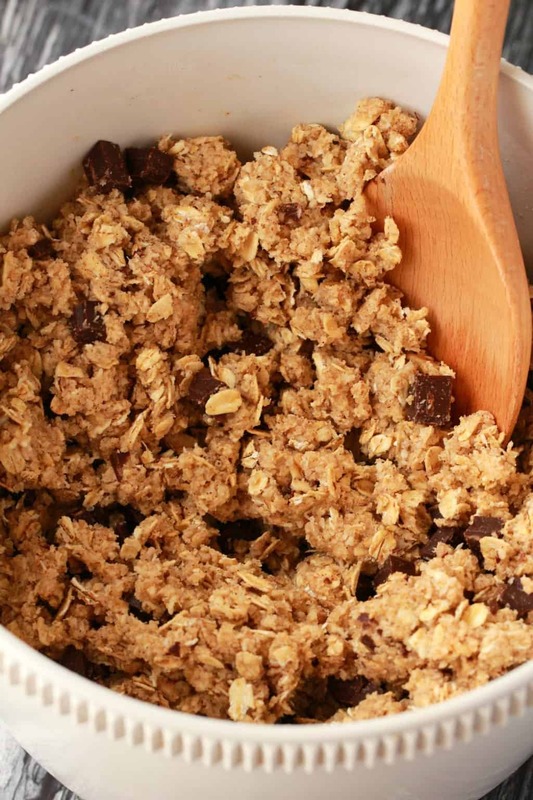 Add the rolled oats, all purpose flour, coconut, baking soda, salt and cinnamon to a mixing bowl and mix together. Cream the vegan butter and brown sugar together and then add the syrup and vanilla. Add the dry ingredients into the wet and stir until the mixture is very crumbly. Add the soy milk and mix in. You may need a little more or a little less, this will depend on the water content of your vegan butter or margarine. Add in most of the chocolate chips, leaving a few of them behind to place on top when they come out the oven. Check if you can roll some of the batter into a ball – it should be sticky enough to do so. If not, add a tiny bit more soy milk. 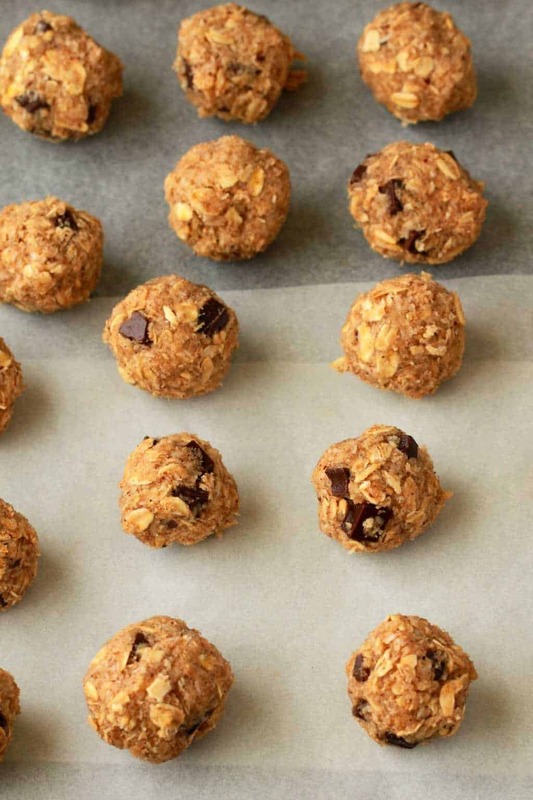 Roll into balls, making sure that you get some chocolate chips into each ball and place the rolled balls onto a parchment lined baking tray. Bake for 15 minutes. The edges should be firm and the tops lightly browned. As soon as they come out the oven, press the remaining chocolate chips into the top of the cookies while they’re still warm and soft. Allow the cookies to cool for a few minutes before transferring them to a wire cooling rack to cool completely. 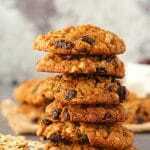 *Adapted from my Simple Vegan Oatmeal Cookies. 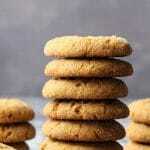 *In the original recipe, we made the cookies much bigger so only got around 16-18 cookies per batch. This time we rolled them smaller, so got 30 cookies. It’s up to you if you want to go with large cookies or smaller cookies, the recipe stays the same. *You can bake these in two batches if you want to space them out on the baking tray so that they don’t stick together while they’re baking. We didn’t – but our cookies did bake together and needed to be separated once cooled. These are such incredible cookies. 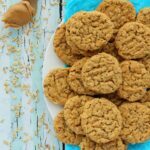 The recipe is so great and makes you forget some of the usual challenges of vegan baking. My one piece of feedback is for my taste I find that the chocolate chips can be reduced. 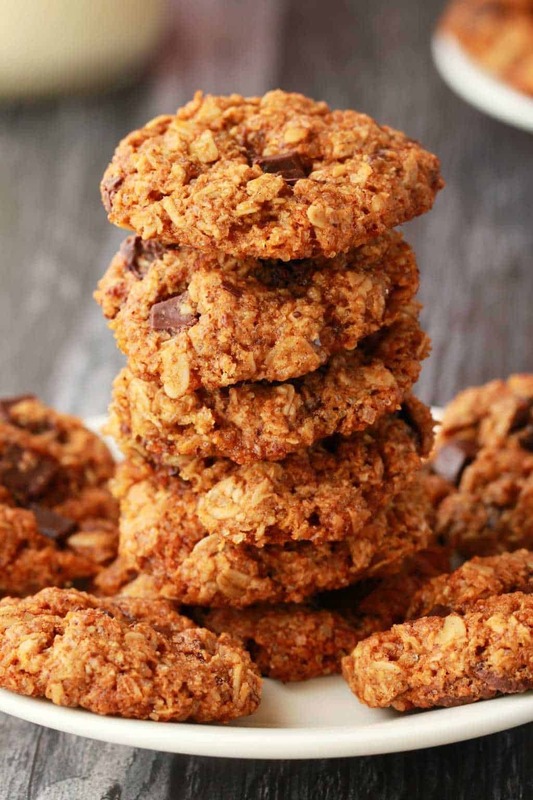 Seriously obsessed with these cookies, I’ve make this recipe at least 5 times. Excellent ez recipe especially bc of the coconut . I use a small organic apple sauce instead of oil. I also replaced the brown sugar with coconut sugar. It’s excellent and still performs perfectly. Thank You. I have been vegan for 50 years. Getting up there. Any issues if I want to omit the coconut? Add a bit more flour? Hi Emily, you can just omit it, and you will likely not need to add in any soy milk at the end. 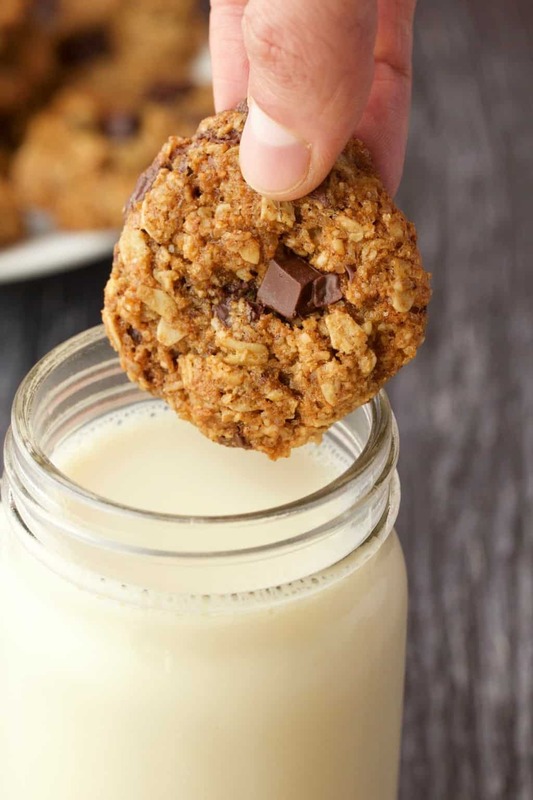 Other commenters on our simple vegan oatmeal cookies made them successfully leaving out the coconut and just not adding in any soy milk. 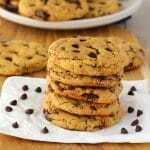 To date, this is my favorite cookie recipe. I’ve made it three times at the request of my kids and 15-year-old niece. The coconut is the best part, don’t leave it out. I added 2 teaspoons of cinnamon (instead of 1) for an extra kick… but you don’t need to, just my personal preference. The recipe is amazing as is.